Our cheery student volunteers pack holiday bags for clients. On Saturday, May 5, the Pantry hosted our first-ever DINNER DANCE, honoring long-time volunteers André and Armella Ferrara. A fundraiser with the emphasis on FUN, this feel good, sold-out party was held at the Knights of Columbus Hall in Mount Kisco and featured the swinging sounds of the Don DuPont Big Band. Thanks to our generous sponsors, our local partners, and all the fun-loving, dancing guests who made this party such a success! Blythedale Children’s Hospital & Kohls Eat Well, Be Well Program, Feeding Westchester, and The Mount Kisco Interfaith Food Pantry are piloting a food "NUDGING" program in our Pantry to help clients identify healthier food options. Using bilingual signage, posters, and supportive materials, the organizations hope to show how simple, low-cost methods can facilitate the choice of healthier options for client—when selecting food items both inside and outside the Pantry. "Icon" signs have been hung in front of low sodium, low sugar, high fiber, whole grain, and other health-promoting options. Webelos Gavin Bunting, Peter Honig, and Sebastian Lashmet created a special food drive flyer to collect food at the Armonk Library, Nick’s Corner Market, St. Stephen’s Episcopal Church, and the Karate Studio. These Webelos collected more than 165 pounds! Webelos came to the Pantry to deliver the food, check expiration dates, weigh items, and stock shelves. More than 30 VolunteerNY folks came to the Pantry to help with sorting and stacking our food donations. Moms, dads, and kids all pitched in, and many brought donations too! We hosted staff from Northern Westchester Hospital, who provided blood pressure screenings to 57 of our clients. Neighbors helping neighbors! Did you know that the Pantry Holiday distribution December 19 and 20 served 500 families? Did you know that the Pantry distributed 661 ShopRite gift cards this week—helping families with holiday grocery bills? Thank you ShopRite and Stop & Shop, and the many, many volunteers and friends of the Pantry for helping to make our distributions so successful. On December 15, Chappaqua Cares gave an Empty Bowls Westchester grant to us! December 12 and 13, the Pantry had a busy week! Distribution days on Tuesday and Wednesday saw 339 families visit. AND it was toy week! We were able to give 292 toys, games, and sports equipment to very happy kids during the distributions. Thank you to the Microsoft team, who pitched in! December 9, Boy Scouts from Vista Pack 101 brought 80 pounds of food and donated some toys for our Toys for Tots distribution. They also helped unpack 1,200 pounds of food! 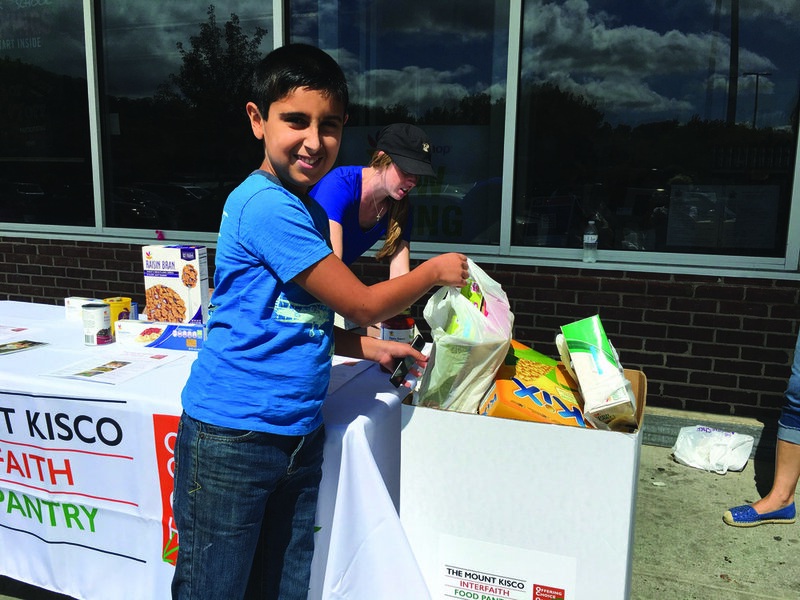 There were many ways you and your families helped us spread awareness about hidden hunger in Westchester. We ran, walked, biked, shopped, dined, and organized food drives to help collect food and funds for the Pantry and help our neighbors in need. September 9 Food drives at local supermarkets. We set up collection tables at Mt. Kisco Stop & Shop and Armonk's DeCiccos and Sons. September 13 Miles for Meals 5K—we ran at Pace University in Pleasantville. September 13 SPECIAL EVENT: Screening of "Wasted!" and Exit 4 Reception In partnership with the Food Bank for Westchester, we screened the film Wasted! that was featured at the Tribeca Film Festival. WASTED! The Story of Food Waste sheds a light on the pressing issue of food waste. September 26 "Sparkle for a Cause" Fundraiser at Crabtree's Kittle House, Chappaqua We dined out in Amy’s Garden for great food and sparkling cocktails! A percentage of the proceeds from the evening went to the Pantry. Thanks to the many volunteers who helped during these busy times, whose happy faces and glowing hearts always remind us that offering choice means offering hope.